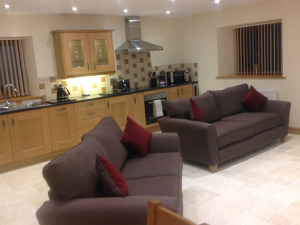 Court Farm holiday lets are stylish and spacious converted barns. Perfect for a stay in scenic Mid Wales, they are just minutes from the Royal Welsh showground. This timber barn has been converted into two separate self catering units, The Granary and The Loft. Each has a twin en-suite bedroom, another bedroom with a 4 ft bed and a separate bathroom, so up to four people can be accommodated. They also have an open-plan living area with a kitchen, dining area and lounge. The kitchens have dishwasher, washing machine, microwave and wine cooler. On arrival we provide a complimentary welcome basket with tea, coffee and handpicked goodies. Horses and dogs can be stabled / kennelled on the farmyard, please contact to arrange. Children welcome from any age. By car: From Builth Wells follow the A470 towards Rhayader for approximately 2 miles, then turn left into Builth Road, first left and drive up the lane through metal gates into the farmyard.